Pairing an Emcee and Producer that don't normally hang together isn't a brand new idea. They might make a song together, or even a whole album; however, creating an entire night of brand new music is certainly something different and special. 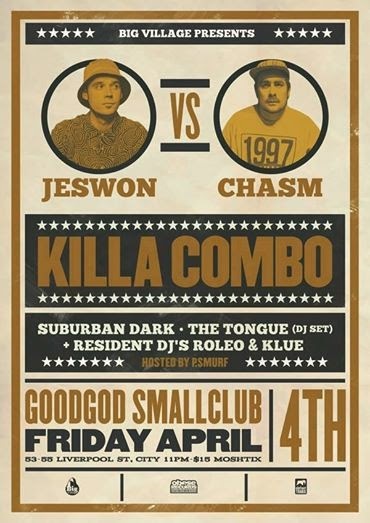 When I saw that the ever charismatic and somewhat underrated emcee Jeswon from the Thundamentals would be teaming up with the Obese producer Chasm (Astronomy Class) for this special, one off performance I was intrigued and excited! They don't have any songs together exclusively as of yet, so anything that they came up with would be something we had never heard before. I was interested to see how the night would go since I'm pretty sure no one had done anything like this before. By the time I got there the party was in full swing. It was a late night, about quarter to one when I arrived. The Tongue was on the DJ tip. Another mix up for the evening, an Emcee to DJ crossover, a somewhat rare phenomenon. The atmosphere at this point was energetic and the crowd was getting hyped up. Since it was late those who like to indulge were just about at the point of getting smashed, although not yet getting cut off from the bar. Jeswon and Chasm took the stage and I still didn't know what to expect. I can't remember what the first mash up song to come on was, but it started with a familiar beat and then Jeswon dropped some Thundamentals lyrics on top of it. I looked to my right to see Tuka watching intently from the sidelines. It was strange to see Jeswon on stage spitting Thundamentals lyrics with his partner in crime watching from the audience. But it added to strange ambiance of the night. The next song up was "Where You At/ The Mash". The beat was from the Astronomy Class song, Jeswon dropped his Thundamentals verses on it, then sang the hooks of the original song, it was a very unique way of doing things. I was hooked, and allowed myself to get lost in the experience. Every song was familiar while at the same time being brand new. So many different projects were stitched together in new ways. The crowd knew every song, every lyric, yet they were remade, each taking on a new life, and becoming it's own creation. We couldn't have loved it more. The hype video for the night had it looking like it would be a boxing match, an epic battle of wits and strength, pitting Emcee and Producer against each other so that only one could come out victorious. In fact it was truly the opposite. The whole night, which the Big Villagers have dubbed Killa Combo, glorifies that spirit of collaboration and unity which is an integral part of hip hop. It transcends the artificial boundaries created by labels and crews that drive wedges between us. I think Sydney in particular has a problem with unity among the hip hop community. I'm saying this as sort of an outsider looking in still. I have only been in Sydney for about 2 and a half years now, so I can only tell you what I have seen and felt with my brief experience in looking in on and being a part of this community. What I see from the northern beaches to Maroubra and then the inner west all the way out to the west, both north and south, there are so many different cliques and crews, and they tend to stick with their own people. I haven't even had a chance to experience most of the hip hop in this city because of this segregation. Hopefully nights like this can help to change that, and bring us all closer together. Although we would have to work on it a lot more, a night like this has already started the process of bringing different crews together. The set finished with an epic rendition of Superpowers which included verses from Tuka, Jeswon, The Tongue, Rapaport, and P-Smurf. It was an awesome posse track and finished the night on a high. But it didn't end there. Then we still got to see Suburban Dark in their element, deep in the creepy part of the night. It was the perfect venue for a night like this because of the small, dance club vibe, plus it didn't have to end early. I assume that the dancing went on until the wee hours of the morning. And we all rejoiced. Overall a great effort by the Big Village crew and I can't wait to see who's up next.